SINGAPORE - Many working adults are consciously making small changes in their lifestyles that will give them a better work-life balance, a survey has found. 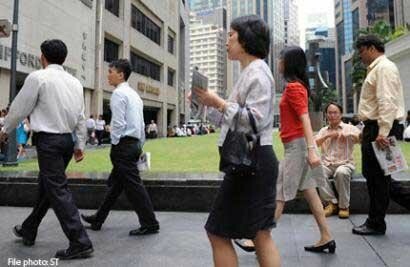 In a recent survey of 200 working adults conducted by undergraduates from NTU's Wee Kim Wee School of Communication and Information, 70.6 per cent of working adults revealed that they were already making tweaks in their lives to manage their day-to-day work-life flexibility. Some of these changes include making time for lunch with their spouses, allocating 5 minutes in between meetings to clear and re-charge the mind, and setting aside a day each week to leave the office earlier for personal pursuits or family bonding. The survey also found that the top three reasons that compel working adults to use flexible work arrangements were to make time for personal pursuits (60.2 per cent), spend more time with family (49.4 per cent) and to perform better at work (36.1 per cent). On the other hand, excluding no need to use flexible work arrangements, the top three reasons that working adults do not use flexible work arrangements offered at workplace are the fear of being perceived as skiving (26.3 per cent), the fear to request for such arrangements (15.7 per cent) and not knowing how to use it (10.53 per cent). Survey respondents said that the top three flexible work arrangements they would like their offices to offer include teleworking (47.2 per cent), flexi-Time (46.5 per cent) and having a compressed work week (45.8 per cent). An online campaign has also been launched to complement the findings of the survey. The Tweak It SG campaign features a selection of 'tweaks' shared by the public over a 10-week period.